San Francisco's largest park, Golden Gate Park covers more than 1,013 acres and is 3 miles long by 1/2-mile wide, larger than New York City's Central Park. Once nothing more than barren sand dunes, Golden Gate Park owes its existence to tenacious Scotsman John McLaren, who created the landscape we see today in the late 1800s, a task many thought impossible. 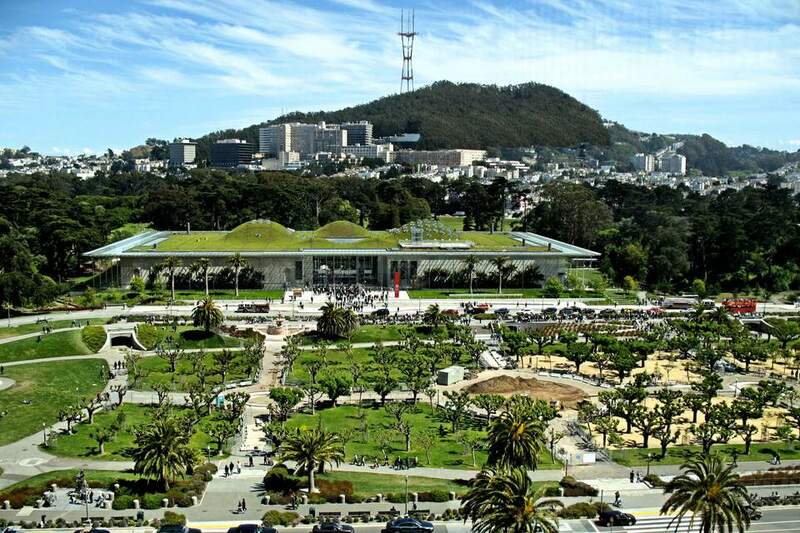 Today, the park is home to two of the city's premier museums, the De Young art museum and the California Academy of Sciences, the Japanese Tea Garden, an outdoor botanical garden, the Conservatory of Flowers, lots of open space and it even has a resident buffalo herd. Keep going through this guide to see some of its top sights. The 49-Mile Drive passes through Golden Gate Park and an easy way to see the top spots is just to follow its signs showing a white seagull with an orange beak and "49 MILE" in blue. If you'd rather walk in the park than drive, try one of San Francisco City Guides' Golden Gate Park walking tours, which include history tours, stroller tours, and tours of the Japanese Tea Garden. The sights in the following pages are just the park's highlights. You can find a lot more things there, which are all described on the Golden Gate Park website. We give Golden Gate Park four stars out of five. It's one of California's most beautiful urban parks and provides a nice respite from the crowded city. If you only have a day in San Francisco, you can skip it, but it's a nice place to explore if you plan to be there two or more days. Start on the west side of Golden Gate Park, facing Ocean Beach. The Beach Chalet is a good place to "go," or to stop for a bite to eat in the upstairs microbrewery and restaurant, which has a nice view of the beach. The Golden Gate Park visitor center is downstairs. Turn right east (away from the ocean) onto John F. Kennedy Drive to see Queen Wilhelmina's Windmill, one of the two honest-to-goodness Dutch windmills that stand near the west end of Golden Gate Park. In spring, tulips bloom around its base. Continuing east on Kennedy Drive, you'll come to the home of Golden Gate Park's small herd of American bison. The Golden Gate Park bison herd was started in 1892. Back then, the park was also home to free-ranging elk, bears, goats, and other animals. Aficionados bring their remote-controlled boats to Spreckels Lake on the weekends, and you can have a lot of fun watching them. Continue east across Park Presidio Drive. The Conservatory of Flowers is a white-framed, jewel-box-looking greenhouse. It boasts a tropical area, a water lily garden and a rotating collection of potted plants. Admission charge. You can walk from the Conservatory to the AIDS Memorial Grove, created as a place to honor the memory of all who have shared in the struggle against AIDS, and a quiet place to walk and reflect. Cross the park going south to Martin Luther King, Jr. Drive and turn right. Park along the road or in the paid lots to explore the park's museums. At the California Academy of Sciences, science is natural: a planetarium, African Hall (with penguins), swamp exhibit with a white alligator, T-Rex and blue whale skeletons and an aquarium. The building sports a "green" roof covered with local plants and has a nice observation deck. Get tips for having a great visit and find information about tickets, exhibits and hours at the California Academy of Sciences website. The de Young Museum's collections include art from 17th- to 20th-century America, the native Americas, Africa, and the Pacific. As San Francisco's flagship art museum, the de Young Museum also hosts special exhibits and their curation, both in terms of presentation and explanation are excellent. Get tips for having a great visit and check the schedule at the DeYoung website. The Japanese Tea Garden is the oldest public Japanese garden in California, created by Baron Makoto Hagiwara for the Mid-Winter Exhibition of 1894. The Japanese Tea Garden covers four acres, densely packed with water features, humpbacked bridges and small-scale pagodas like the one above. Surrounding them, you'll find a variety of trees, flowers and bonsai trees. Get tips for having a great visit and check hours, and ticket prices at the Japanese Tea Garden website. Continue west on Martin Luther King Drive and follow the signs to Stow Lake. The road will take you in a loop drive around it. The largest Golden Gate Park lake is popular with fly fishermen and amateur boaters. Rent paddleboats and rowboats on the northwest side. Continue west and you will reach Great Highway. Stop at the Cliff House or Beach Chalet for refreshment. Both are good places to watch the sunset. Golden Gate Park is a long, skinny park. If you want an interactive version of this map that you can get driving directions from, try this custom Google map. Golden Gate Park is most easily accessed off 19th Avenue, which runs through the middle of it. You can also enter from any of the major streets that bound it. The 49-Mile Drive enters on the west edge of San Francisco at Sunset Boulevard and Lincoln Avenue on the south side or you can enter from Great Highway on Martin Luther King Drive and join it by watching for the signs. Free shuttles run on summer weekends and holidays, about every 15 minutes, making it easy to get around with parking hassles.